We’d love your help. Let us know what’s wrong with this preview of Requiem by G.S. Jennsen. The end of the world began with a library query…how will it conclude? What began as a chance discovery of an anomalous signal is now a multiverse war between humanity and its genetic ancestors over who controls the levers of life and death. Over who decides what life is and whether it will be allowed to exist. For the ruling Anaden Directorate, victory means immortality. Fo The end of the world began with a library query…how will it conclude? The Directorate has perfected the art of conquest through obliteration. But humanity has advantages the Anadens do not. They are led by a woman who’s made a career of meeting the devil at the crossroads and sending him home in defeat. Caleb Marano wields a power as ancient as the universe itself. Alex Solovy manipulates the fabric of space-time at her whim. Unlike the Directorate, they fight for something greater than themselves. And now, they have one more Solovy on the team. Our universe is but a snowglobe—an experiment born of desperation and hope. The true universe is unfathomably vast, teeming with life and untold wonders. And it is enslaved. To ask other readers questions about Requiem, please sign up. Is this the last one, as in series finished? BEWARE!!! THIS REVIEW CONTAINS SPOILERS!!! Okay, I just finished the book and I am trying to put together a coherent thought about the book. First of all the big scare. For a moment I really thought you went on and killed Caleb. Worst moment of the whole book. My kindle risked flying out of the window. But then as soon as Akeso came up I knew it wasn't the end and I knew there was hope for Caleb. The letter he wrote to her was just heart-ren BEWARE!!! THIS REVIEW CONTAINS SPOILERS!!! The letter he wrote to her was just heart-rending. First of all... Miriam and David: I love how they "re-grew" together. David struggles with his new life and struggles to find his new identity and a place for himself in the world. And this struggle is reflected in the relationship with Miriam. And Miriam at the same time as to deal with him being back. She has to knock down all the barriers she erected erase 25 years without him and discvoer again the reasons why she fell in love with him. They have to learn to be a couple again. And I loved tremendously how the relationship grows during the book. They have to learn about each other again and find again their place in the universe. And I think the last thought form David sums up their journey perfectly "The Universe didn't matter. He was home." He made it. They survived him going away on a mission well knowing what happened last time he was at the command of a ship. Their arc was beautiful. And you know I have a soft spot as large as a massive black hole for Miriam. She's friggin' awesome! She's as tough as adiamene. I love her sooooooo much. (I should create a Miriam fan club). Thank you for bringing back David and creating this. Harper and Morgan: The fluff... Okay I was vomiting rainbows and unicorns at the end at the hospital when Morgan lets her feelings out. They deserved and happy ending as well. Eren and Cosime: Yes! And about time too! Noah and Kennedy: I must admit that when he proposed I had the same reaction as Kennedy. I was like "What? Did I read it correctly?" I mean I am happy... I have been waiting for this moment for a very long time. Richard and Will: The scene where Will thinks that Richard was in love with David was a tad hilarious. Ok, then it got romantic but at the beginning was hilarious. I am glad the two of them are happy. They went through a lot and their separation albeit temporary was painful. Valkirye: I love her. I like the part at the beginning where she's in a physical form and start exploring and get excited at holding a fork. That was such an amazing moment. Just as much as at the end when she helps Vii to explore her physical form and to learn to speak. Valkirye is another amazing character that grew fantastically. She started as a mere computer and then became this almost tangible person with a beautiful soul. Through Alex and Caleb by default she learned some aspect of what really means being human. And I think the apex of her growth for me was when she's on the planet and tries to help with the victims. I grew so attached to her. "I will always be your friend. Death didn't change this. Nothing can change it. If there's one thing I would ask you to realise, as it will make everything a lot simpler for both you and I, it's this: I am not your sidekick any longer" One of the best line of the entire series. Second best line in the series... Alex in Ivanova's style! Awesome! The story had been a wonderful rollercoaster and not just this book. The whole Aurora series. I am actually looking forward to going back and read it from scratch all the way to the end. It has become one of my favourite sci-fi series of all time. The character development is incredible... the settings are perfect and as you know I always liked the whole AI side of the story and all the implications of the Prevos. Fascinating. So, to conclude my usual ramblings... THANK YOU. THANK YOU. Thank you so much for creating this amazing world. I grew attached to a wonderful array of characters. I laughed with them, I cried with them, and felt pain with them. They became some good friends that I was happy to meet again every time you published a book. Now the story is over and it's a bit sad. I know I can read it when ever I want so it's not an actual good bye but it still saddens me. The final book in the Aurora series and it didn't disappoint. Justice and redemption, regret and triumph, absolution and resolution, a perfect blend of fiction and morality play. This series showcases the best of humanity without shying away from our flaws. It shows us the world that could be if we strive to be better than we are and hope for the best for the future. I'll visit this world again and again. Read it and see why. A stunning, thrilling finish to an already superb series. This was a series that hooked me into science fiction, and one I plan to have a long re-reading relationship with. While sad to say goodbye to these characters, I really can't wait to see what GSJ comes up with next! One of the great challenges for the final installment of any series is building upon everything that has come before and wrapping up the story in a way that feels both appropriately climactic and satisfying to the audience. That challenge becomes even greater when said series is a nine-volume saga spanning entire universes (yes, plural) and featuring a huge cast of characters for whom the stakes involved are monumental. 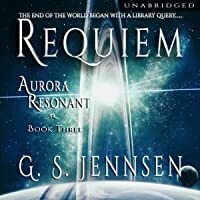 Requiem demonstrates that not only was Jennsen up to the challenge - she kno One of the great challenges for the final installment of any series is building upon everything that has come before and wrapping up the story in a way that feels both appropriately climactic and satisfying to the audience. That challenge becomes even greater when said series is a nine-volume saga spanning entire universes (yes, plural) and featuring a huge cast of characters for whom the stakes involved are monumental. Requiem demonstrates that not only was Jennsen up to the challenge - she knocked it out of the park. One of the things I appreciated most about this book was its pacing. There's a lot going on, and I spent much of the book frantically swiping through the pages on my Kindle, anxious to find out what would happen next. I loved those scenes with all of their tension and excitement and intense emotion. But I also appreciated that the story slowed down a little in between all the action to give readers a breather and allow us to see the characters' reactions to everything happening around them. It allows for some fantastic character development, which I'll talk more about in a second. But then, just when you think things are going to stay calm for a little while, Jennsen dials the intensity up to 100 and sends the characters headlong into an even more dire set of circumstances. It makes for a thrilling ride but never feels like an overabundance of action and explosions just for the sake of action and explosions, which I appreciated. The character development here is excellent. By this time, fans of the series have already come to know these characters very well and love them even more. But one of the things that makes these books so great is the way the characters continue to grow and develop and change even after eight prior novels. We see them face new challenges and use the experiences they've had before to react in ways that show just how far they've come. We see their relationships with each other change as a result of the circumstances they're placed in. We've watched them become extraordinary people, and our hearts swell with pride as they bravely face each new threat because we've been on this journey with them for so long, and it kind of feels like we're cheering old friends on from the sidelines. Alex, Caleb, Eren, Miriam, and so many others are fantastic, as always, but one of the characters who really grew into her own here was Valkyrie. I've always loved Valkyrie, and she's grown a lot over the course of the series, but it was fascinating to see her development here as she seeks out new experiences and is forced to cope with the intensity of certain human emotions. The romance in the series is another thing I've always mildly enjoyed, but I found myself especially drawn to it here for some reason. Maybe it was just because there were so many downright adorable moments between characters. Maybe I just got all nostalgic and sentimental knowing that this was the last book in the series. But the scenes that showed some of the romantic relationships between characters in this book were some of my favorite parts. Fans of Harper and Morgan, Miriam and David, and Will and Richard should be especially pleased. While the story does wrap up in a way that feels appropriate and will likely be satisfying to most readers, I had mixed feelings about it. In the interest of not spoiling anything, the only other thing I'll say about that is that I don't think I really believed the sense of danger or devastation that was maybe intended, and I'm also just a cynical person who enjoys soul-shattering endings. So that might explain part of it. Nevertheless, it was an emotionally impactful ending in other ways and felt like the right one for the story. I will say that I did really love how the first line of the entire series tied into the ending in ways that I doubt anyone really saw coming. Thinking back (not so very long ago, really) to the conclusion of the Aurora Rising trilogy, I was satisfied. Despite the fact that it was left open and we knew there was more to come, it still felt like a reasonable conclusion. I thought, "What more could there be? What could be bigger than this magnificent final battle with the Metigens?" 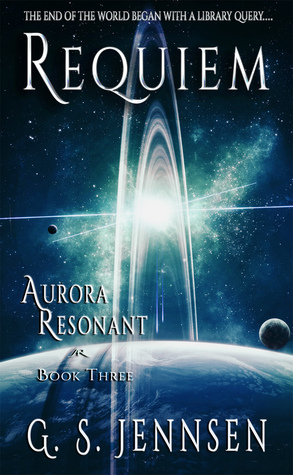 And then came the Aurora Renegades trilogy, where we started to get glimpses of what might be coming next. There was a ton of information Oh boy, you guys. And then came the Aurora Renegades trilogy, where we started to get glimpses of what might be coming next. There was a ton of information thrown at us and a ton of character development, and by the time we reached the end of Abysm , there was so much momentum that we were launched directly into the Aurora Resonant trilogy. The story had just continued building and building and building, and events in Relativity and Rubicon were such that I knew the finale in Requiem was going to be huge (not to mention the implications of a title like 'Requiem' at the end of a musically-themed series were sure to be interesting). And Requiem proved to be the epitome of a conclusion. Events and information from as long ago as Starshine and Vertigo were still relevant. The story accounted for all the major character development that took place over the last few books, and we continued to see growth and development among the newer characters we just met a couple of books ago. At this point I almost find it hard to talk about Alex and Caleb (no offense whatsoever to the characters) because, while they're obviously running the show, it's the newer characters like Eren and Nisi who steal the spotlight for me. I've loved Eren since his introduction, but there's been something about Nisi I've really loved too, especially in light of information we learned at the end of Rubicon and despite the fact that he hasn't done anything particularly exciting. He just has a presence on the page and kind of commands all the scenes he's in (although Miriam gives him some competition at times 😉). Nyx has also come to be a favorite because I have a soft spot for antagonistic lady assassin-type characters (no way!). After all of this, though, I still had no idea how the story was going to end. I had my theories, of course, some of which had been in development since the beginning of the Resonant trilogy, and it some ways bits of each of them ended up being correct. But in the end (*ba dum tss* the finale ended up being bigger and more spectacular than I expected. And up until the last few pages, we actually didn't know for sure what direction the story was going in regards to certain characters, and events were such that I personally would have found any of the options totally appropriate. Regardless, it was a satisfactory ending for an incredible 9-book ride. I'm so glad to have been along for that ride and I can't wait to see what G.S. has in store next! The 9th and final book in the Aurora Rhapsody series wraps things up nicely. I have read all nine books as well as the short stories and, upon finishing Requiem, I was left with the sense of successfully completing a long and elaborate journey. I'm not saying that the reading was laborious by any means. Ms.Jennsen does a remarkable job of keeping the reader interested and turning pages to see what happens next, then waiting for the next book in the series to become available. I admit that I had The 9th and final book in the Aurora Rhapsody series wraps things up nicely. I have read all nine books as well as the short stories and, upon finishing Requiem, I was left with the sense of successfully completing a long and elaborate journey. I'm not saying that the reading was laborious by any means. Ms.Jennsen does a remarkable job of keeping the reader interested and turning pages to see what happens next, then waiting for the next book in the series to become available. I admit that I had to print out the "Dramatis Personae" that Jennsen so thoughtfully provided on her website in order to keep all the characters straight, especially after what seemed to be an interminable wait between books. But, as soon as the next book began I immediately found myself yearning to find out what was going on in the world of each one, and fell right back into each character's life again. For those who haven't read Jennesen's books before I would provide a couple thoughts. First, start at the beginning. While each of these novels is a great work in and of itself, you will be cheating yourself if you try to jump in, in the middle of this saga. Best advice, read Startide Rising and if you are not hooked, well . . . I would be astonished. In previous reviews, I have gone on and on about G.S. Jennsen's writing so, I won't do so again. However, at the risk of being redundant, I will praise her character development, dialogue, world-building, wit, and style. I could continue with incessant praise until people begin to suspect that I am her publicist or something so, I will make one small criticism just to dispel those suspicions. Occasionally, the dialogue between some of the couples, Alex and Caleb for instance, is a bit over the top. I wish I would have written down one of the quotes to illustrate my analysis. But I didn't. So, let me just put it out there. Some of the things that Caleb says to Alex during highly emotional moments, no man has ever, or would ever say. We may feel that way but we wouldn't be able to articulate it that way. Our brains just don't work like that. I understand that some of the lines spoken by Caleb, Richard and others are exactly what women wish their loved ones would say but I just don't see it happening that way in this universe. So, at the risk of incurring the wrath of all of her female readers and even G.S. Jennsen herself, and at the risk of being labeled sexist and all sorts of other horrible things, I have uttered a tiny criticism. I feel better, now. Wow. What an epic conclusion to an amazing series. Did I expect the end – definitely not? Was I blown away – most certainly? I never expected when this whole thing started that ‘a library query’ would lead to - well you’ll have to read to find out. I went into this book knowing the end was coming, knowing the fate of the galaxy would be decided. And while I got that, I laughed, cried and worried my way through the personal problems of the characters. This series is a grand story on an epic scale Wow. What an epic conclusion to an amazing series. Did I expect the end – definitely not? Was I blown away – most certainly? I never expected when this whole thing started that ‘a library query’ would lead to - well you’ll have to read to find out. I went into this book knowing the end was coming, knowing the fate of the galaxy would be decided. And while I got that, I laughed, cried and worried my way through the personal problems of the characters. This series is a grand story on an epic scale and yet it completely focuses on the lives of those who live through its events. I fell in love with these characters in Starshine and I’m more in love with them after Requiem. Even the characters who joined up along the way have become favourites, their personalities adding to the richness of what was already a deep pool of lovable rogues, capable leaders, strong warriors and determined people. We’re shown battles between galaxies and universes, between huge fleets of ships and technologically advanced races. But seeing it through the eyes of those in charge, those caught in the middle and those willing to sacrifice themselves for the greater good – it gave me a connection that made it feel real. That’s what good storytelling is all about, feeling for the characters, wanting them to come out the other side intact. The scale of this entire series is amazing and the big picture is always there in the background. But it’s the little things that matter, the love, lives and survival of fictional characters that have become more than words on a page. And there are moments in Requiem that will have you reaching for the tissues – more than once – beautiful moments that allow us to feel what these characters feel. Requiem is the perfect finale, it wraps things up as it should. It’s a fast paced read that kept me turning the pages, wanting to know what came next but it never left me feeling lost or confused. The quiet moments were perfectly placed to allow me to breathe, to soak up the moments that matter before moving on to the next crisis or quick moving event. But the end – which came all to soon because I wanted to stay in the world G. S. has created – left me in awe, satisfied and happy. Whenever I was not reading those books, I was thinking about them, wondering what would, should, could happen next. Talking to myself about why characters made questionable decisions, worrying about characters dying (which for some of them, unfortunately, came to pass), screaming at characters to change their stubborn minds. It took me about a month to read this entire trilogy of trilogies. Over 4000 pages in just a few weeks. Because I could not stop reading it, unless I had to. Real life needed Whenever I was not reading those books, I was thinking about them, wondering what would, should, could happen next. Talking to myself about why characters made questionable decisions, worrying about characters dying (which for some of them, unfortunately, came to pass), screaming at characters to change their stubborn minds. It took me about a month to read this entire trilogy of trilogies. Over 4000 pages in just a few weeks. Because I could not stop reading it, unless I had to. Real life needed me, but I very often just wanted to be done with it and return to this universe, these characters, this story. I did not want this series to end. Because it stands above most of what I have read (which is not much at all) in how much I buy everything in it and how believable it is as a whole, how real it feels. This begins and ends with the many complex characters who I have gotten to know very well, and not just their laudable sides, but their weaknesses and flaws too. I love too many of the characters to name them all. Alex, Caleb, Mia, Devon, Malcom, Noah, Kennedy, Miriam, Richard, Mesme, Eren, Nisi, Nyx. And others I loathe, like Olivia, Marcus, Pamela, the Primors. It feels real because people talk to each other like they really do -- heightened and without all the mumblecore of real life of course, but otherwise real. They curse like sailors, they interrupt each other and they don't suddenly become too dumb to clear up obvious misunderstandings because the plot demands it. It feels real because it is written with enough imagination to pull off at times quite weird and strange worlds, aliens and technology. But it also feels better than reality. Utopian even. Despite all of the warring and dying and destruction, those people on those planets often have a more exciting life than we do. Aliens, other planets, basically holodecks, friendly AI, medicine far beyond our means and so on. A story where our dreams and aspirations become real, then. And where people have to fight for them with all they are and all they can. Because every utopia can always give birth to a dystopia, and vice versa. I'm pretty sure that I read this book much faster than the other 8--but that's only because I stayed awake until almost dawn reading. This novel completes the visionary Aurora series by taking us deeper into Amaranthe with great plotting, emotional scenes, daring escapades and oh so much growth for the characters. Sad to reach the end of this series but I loved every page! I am so glad I stumbled upon Starshine a couple months ago and was able to go on this wonderful adventure through each book. This series will definitely be added to my collection of series I like to read again and again. Loved every book in this amazing series! Well dang - just finished the last book in this incredible sci-fi series. I LOVED the whole convoluted thing and want to start over so I can experience it all again! The author has a gift for beautiful storytelling and has done a fabulous job of creating intricate realities with well developed characters and crazy-believable technologies. She sets it all spinning within a mad maze of twisting plots that keeps you tearing through the pages when you really s Loved every book in this amazing series! The only disappointment in this novel is that it marks the end of this story arc. It is a fitting, uplifting, emotional end to what has been a true joy to read; I envy anyone getting to experience the story for the first time. The conclusion to a 9 book series - and every book is worth buying. Characters stay true to form and demonstrate the growth that we've seen over the course of the series. Action, pacing, plotting, dialogue all excellent - and some great lines (especially Miriam!). My wife and toddler are sick, and I spent the time I had to myself reading this instead of catching up on badly needed sleep! All I can say for right now is I must have cried for at least five minutes at the end. I ABSOLUTELY LOVED IT and I love this series! WOW. She saved the best for last! What a smashing finish to the three-trilogy cycle. As always, a rich tapestry of narratives and characters. I enjoyed the subtlety of each individual's interaction with Richard's "return." As in all of her books, innovative ideas and complex plots. Brilliantly interwoven to include some of the unique characters and species that we hadn't seen for awhile. A satisfying flourish to end the read! Warning- My review will contain general spoilers about previous novels in the series. There will also be a section with Requiem spoilers but I shall give you plenty of warning to bail before you get there! In the final installment of Aurora Rhapsody, we finally see all of the characters’ storylines that were explored over 8 novels (and a series of novellas) come to a gripping and satisfying conclusion. The number of characters has grown immensely over the series yet they all still seem just as re Warning- My review will contain general spoilers about previous novels in the series. There will also be a section with Requiem spoilers but I shall give you plenty of warning to bail before you get there! The number of characters has grown immensely over the series yet they all still seem just as relatable and different from one another. Jennsen continues to pull different characters to the forefront and organically push other characters to the periphery to keep the storylines focused. I particularly loved seeing more into the mind of Nyx! The stories of the characters that got less pages this time around still feel vital and honored in the ways that they were incorporated. Jennsen does a fantastic job of bringing this saga to a climax full of twists and surprises while leaving leaving me feeling like it was the obviously perfect ending to the series all along. It is amazing to see how all of the little details really mattered in where Jennsen took us. It feels like all of the plots in all previous books had a satisfying impact on the ultimate events of the series. It is odd to think back to the universe first introduced to us in Starshine. The world we started in was not all that different than our own. Personally it was even more relatable because I grew up in the Seattle area (Side Note- I just paused writing this review to reread the first lines of Starshine and realized I was still reading 45 minutes later). The eVi and ocular implants are technologies we could see coming into existence soon. Alex experienced relatable parent and relationship issues. Most of the initial story was grounded in the dynamics we experience day to day. The reader experiences and processes harder science fiction elements as they develop alongside Alex and the Aurora universe. As a first time reader I barely even noticed the transition into teleporting around the universes and experiencing the consciousness of a sentient plant-planet. The fictional universe having such a rapid technological evolution was not only great for guiding the reader into harder science fiction elements, but it kept the series feeling new and fresh for each of the nine novels. Requiem is the grand finale in the story GS Jennsen set out to tell us, and I couldn't imagine being happier with the result. SPOILER ALERT! The rest of the review is reserved for those who have read Requiem. Unless you are someone like my roommate who likes to ruin everything for themselves. I cannot wait to see how the storylines get shaken by everyone instantaneously being put into a single universe. This final chapter feels like it closes out the story of humanity emerging into the intergalactic (interuniversal?) community. Now it seems that we will be moving into the story of humanity settling in as the new species on the block. We got to watch Mia begin the politics and alliances in the new home universe that will almost certainly be a great feature of the next saga. Ambassador Requelme is exactly who I want as humanity's figurehead! Seeing the Novoloume homeworld was a delight and I can't to see more alien cultures explored. The evolution of the AI’s has also been progressing steadily over the novels and it finally feels like we have reached the point where they are fully realized individual beings. *EDIT: I may have leapt to conclusions about the setting of the upcoming saga, oops! When GS surprised us with the reveal that Aurora Rising was just act one of a three part play, it was the start of a vast expansion in scope for the story (read this blog post from 2015 about the reveal, it is giving me some serious deja vu about now https://www.gsjennsen.com/blog/2015/6...). She made the entire first trilogy feel like a fantastic prologue to the real story she was going to tell us. sur toute la série Aurora : des personnages attachants un peu trop gentils, un peu trop par couples, un peu trop d'amour, mais un univers complexe et cohérent, avec du suspense, de l'action, des aliens, de la technologie (l'immortalité devient même possible) et une écriture fluide. La théorie de l'origine des Humains dans cet univers est ... originale. One of my favorite Series of all time. so special. I listened to the audio books and was captured by the characters. I almost didn't want to listen to the last 20 minutes so I could imagine the ending the way I wanted or to not even end, but G.S. was as always right on with the ending. What a story Thank You. A very solid ending. I'll most assuredly be reading anything this author writes in the future. "Creatio ex Nihilo" "magnums opus"
This is an amazing series. Great ending to a great series.